The Leopard has been the standard in High value/High quality at a low cost motor on the market. 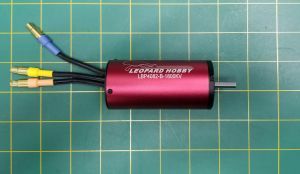 Leopard has released a new version of the popular 1600kv and 2200kv sizes, called the X2. Same physical size & performance with different end bells and logos. 40mm Diameter by 82mm Long Brushless Motor by Leopard Power. Hand wound for high efficiency of up to 90%. Comes with high quality bearings and neodymium magnets for high power. Includes endbells that are assembled with screws for both strength and ease of maintenance. Watts: 2400 with Over 3500 Burst. If you are using the OSE-80600 or 80610 mounts, we suggest the leo-4050 water jacket. For mounts with no rear clamp, you can use the longer leo-4068 Water jacket. Hard to fault. Good power. Make sure your ESC is up to it; the 2000 & 2200KV motors draw BIG currents.